Bodacious Dream WINS the 2013 Atlantic Cup Race! In what was an amazing finish to an amazing day’s racing to an AMAZING three-week long competition, Bodacious Dream today was declared the winner of the 2013 Atlantic Cup Race!! The competion through all three legs of the event was non-stop … and every victory was hard-won and well-deserved. Huzzah to all seven teams and to the Atlantic Cup Race organizers … and HUGE congrats to co-skippers, Dave Rearick and Matt Scharl, to the great inshore crew and to the whole Bodacious Dream Team! Today proved to be another incredible day on the water. 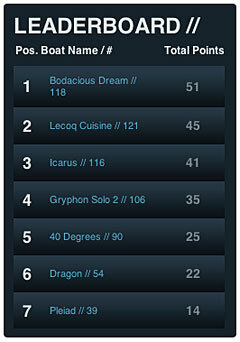 It is in the nature of these competitions, that fortunes can change so quickly … and going into this last day, it was still a wide-open race – with #118 Bodacious Dream leading #121 Lecoq Cuisine by just ONE point, followed by #116 Icarus NINE points behind BoDream. So, the pressure was on everyone! 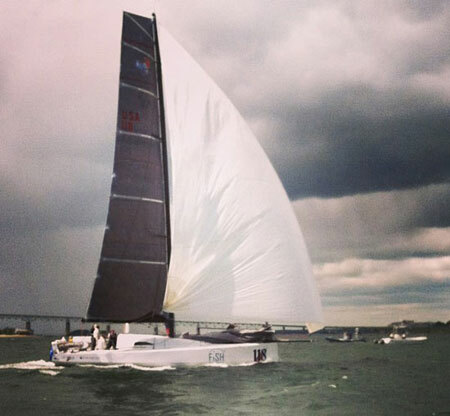 Icarus had an incredible day, winning both Sunday races, which after their one first and two seconds yesterday, made them the clear winner of the inshore leg of the competition. Congrats to the inshore ninjas of #116. Throughout both of today’s races though, Bodacious Dream held rock steady, rarely slipping position. 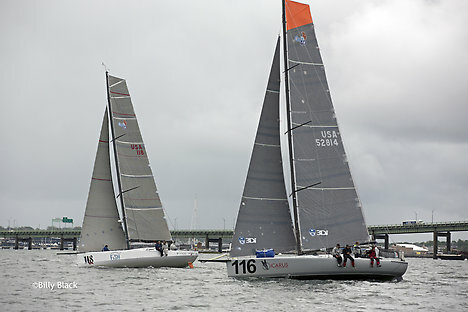 With the exception of a 6th place finish in the second Saturday race, Bodacious took one of the top three positions in all the other 4 inshore races. Lecoq Cuisine had to outpace Bodacious Dream today if they were going to grab the prize, but they couldn’t do it, finishing today’s races in 4th and 5th position respectively. Remember it was Lecoq Cuisine, who finished just 8.5 and then 5 minutes behind Bodacious Dream in the two offshore legs of the race. 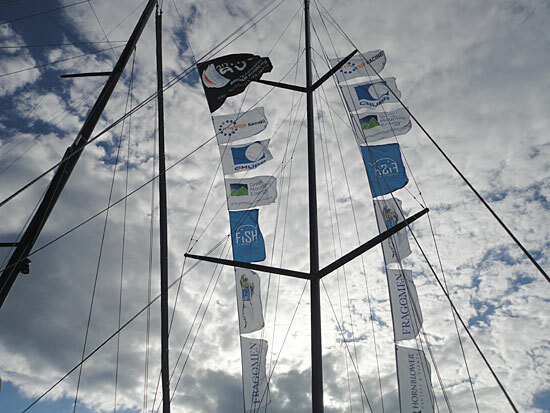 Throughout the competition, they proved themselves great sailors and awesome competitors – and much respect goes their way. • Here for you are the results of today’s two “inshore” races. That’s about it for now. We’ll be back to you here soon with commentary, photos and videos and a real wrap-up soon! Remember, more frequent updates can always be found at the Bodacious Dream Facebook Page! And one more big thank you for following along, and for all your good wishes and excitement. It makes a big difference when you’re pushing hard out there, to know you have such super support in your corner. Bodacious Dream Wins Leg Two of the Atlantic Cup Race! Bodacious Dream was first across the finish line for the SECOND leg of the Atlantic Cup Race! 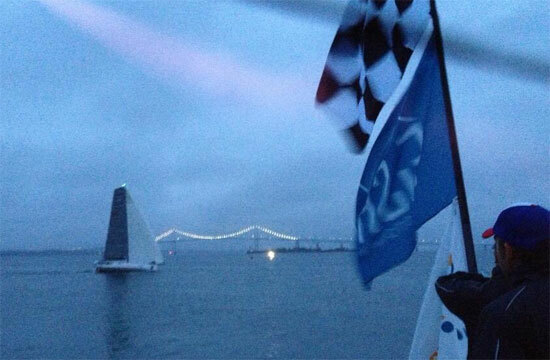 (NYC to Newport, RI) Matt & Dave crossed over tonight at 8:14 EDT! 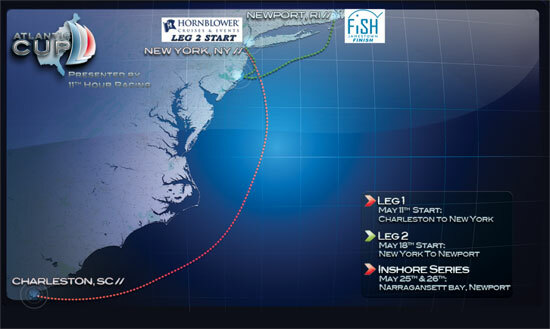 This follows upon their 1st place finish earlier in the week in the FIRST leg of the race (Charleston, SC to NYC.) Get all the latest news on our Facebook page and right here on our LATEST UPDATES page! 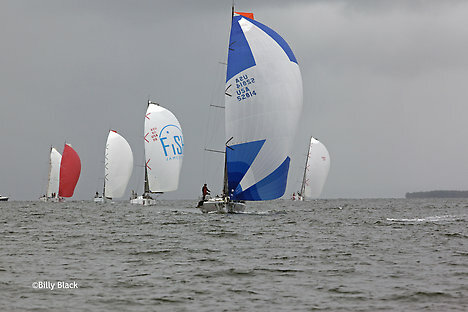 What an incredible competition this has been, and there’s a THIRD leg of inshore racing coming up this weekend! Stay tuned for that and more photos and videos! But getting back to today’s race … it was a truly legendary race … and here are SOME of the reasons why. Lecoq Cuisine - who finished 8.5 minutes behind BoDream in the first leg – finished just 5 minutes behind them in this one! Gryphon Solo II finishes 3rd, just 10 minutes behind BoDream. Even more amazing is that ALL seven competitors finished the 30+ hour race within 45 minutes of each other! Weather and wind conditions and variations were extreme and diverse. More on all this soon! Interestingly enough, this is the same leg of the Atlantic Cup that Bodacious Dream won last year! Total Elapsed Time for Bodacious Dream was 1 day, 6 hours, 19 minutes and 38 seconds! 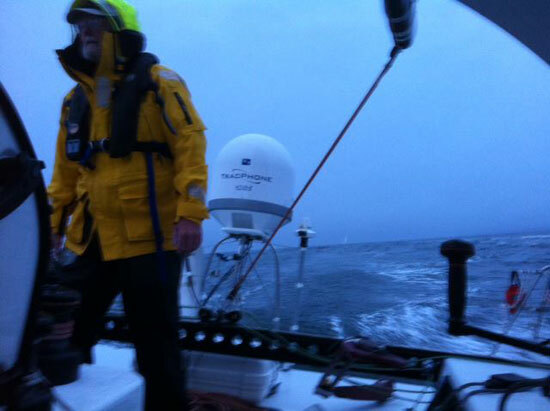 And here is a photo – taken late in the race out the back of BoDream. On the horizon, you can make out Lecoq Cuisine. What a relentless competitor they proved to be! 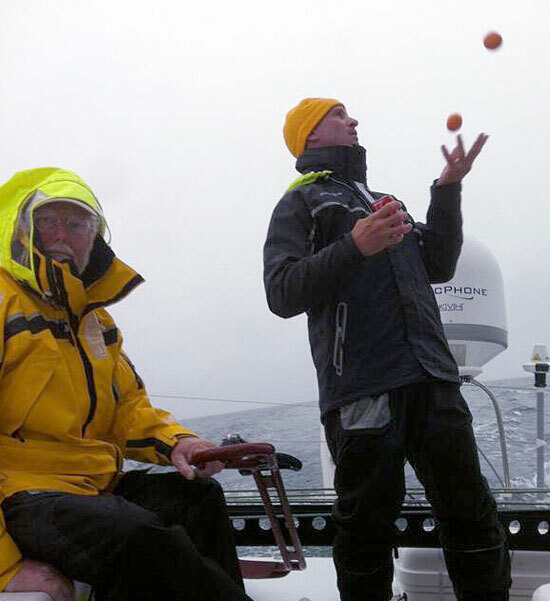 And in this last photo from earlier this afternoon … when Matt was relieved of his turn at the helm, he decided to forego rest and to juggle clementinas instead! And this was a race that Dave thought MIGHT just go till Tuesday morning! Instead it was a full tilt sprint right from the gate. Anyway, that’s about all we have to say right now. MORE photos and videos … interviews AND “expert analysis” coming soon! We’ll leave it with BiG congratulations to all the teams in the race, to the race organizers and to the whole Bodacious Dream Team … for a job well-done … and of course, to all of you for your steady support! Tango on the Wando Warm-up Charleston! The Atlantic Cup Race is coming up in sneak attack mode and Bodacious Dream is almost ready for it! Matt Scharl, my co-skipper, done planting his farm fields, is joining me here in Charleston today where we’ll spend the next few days before the start of the race on Saturday finishing our preparations and mapping our strategy to match the weather forecasts. The boats are all gathered now at the Charleston City Marina. I was one of the last to arrive, having been up the Wando River at the City Boat Yard where Bodacious Dream was cozied up for the winter and then undergoing maintenance. With the maintenance completed, Bodacious Dream and I left the boat yard Wednesday morning and headed down the Wando River to Charleston. 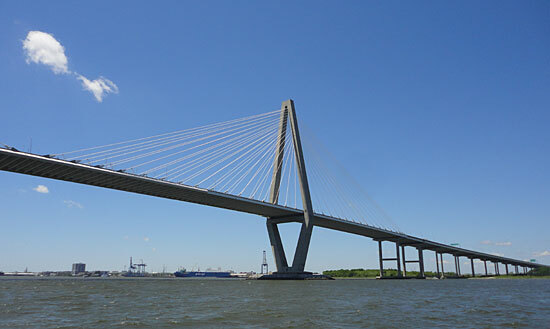 As you get close to Charleston, you come upon the famous Arthur Ravenel Jr. Bridge. I had a chance to meet some of the new competitors this year and reconnect with old friends and fellow-sailors – what an incredible bunch of folks. I hope you’re looking forward to this race and our next “expedition” as much as we are. 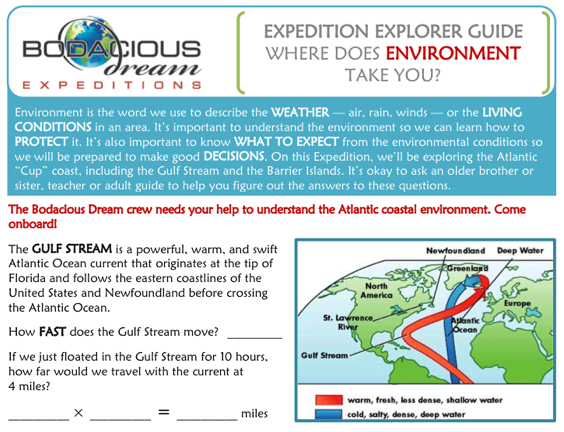 We’ve got a whole new Atlantic “Cup” Coast expedition right here in place on BodaciousDreamExpeditions.com … with brand new “Explorer Study Guides” for you (and the kids) to check out. Actually, everyone can learn something on this trip … the Atlantic Seaboard is such a treasure of natural and historical wonders … and we tried to cram a bunch of that info into the Guides, which I’ll also be referencing in my daily updates. 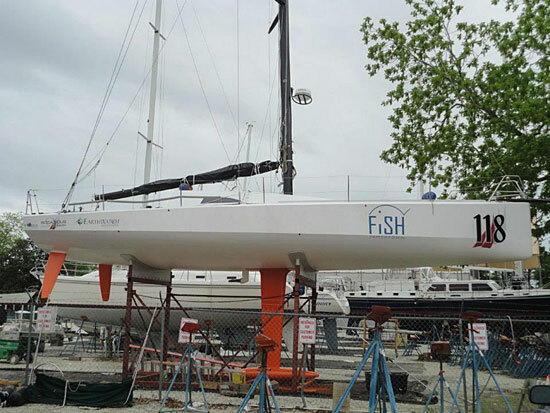 Well, it’s just about time now; the Atlantic Cup Race starts this Saturday! Bodacious Dream is in Charleston, SC getting the finishing touches of maintenance she needs to be as quick as ever, while my co-skipper, Matt Scharl gets the last of his corn and soybean crops in so he can join me in Charleston for the final preparations. Just as we did last year, Matt and I will team up again against some of the best sailors in the world in this great American race up the Atlantic Coast. 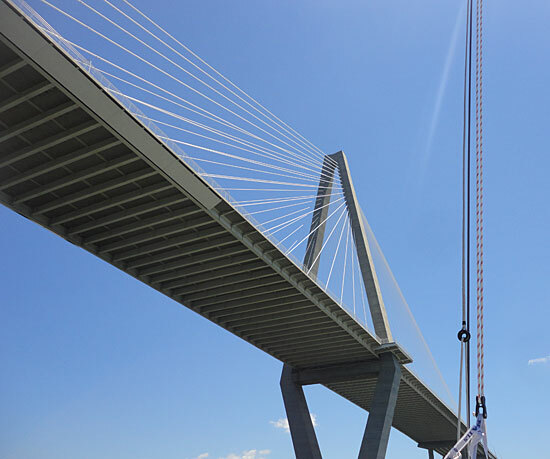 Our first leg, starting on May 11th, will be the 648-mile long run from Charleston, SC to New York City before heading onto Newport, RI. Once on the water, we’ll have to make tactical decisions on whether to venture out to the Gulf Stream and gain additional speed from the fast moving currents, or stay closer inshore where there might be more wind; this is always a tough decision. We’ll cross Cape Hatteras, known as the “Graveyard of the Atlantic” because of its epic history of forceful weather and unpredictable currents before determining our final strategies for approaching New York City. Last year’s race found us in pursuit almost all the way before settling into third position, finishing in New York City under the glow of city lights, the Statue of Liberty and the famous re-building of the World Trade Center. We’ll then spend a few days in New York City relaxing, doing a fun Pro-Am race and attending an interesting conference called “Living on the Edge: The Atlantic Cup Presents Coastal Communities and Climate Change.” Then on May 18th, we start the second leg which takes us out to a turn buoy off the coast of Virginia before heading north up along the coast and into Newport, Rhode Island. Those of you who stayed up late to follow last year’s finish on the tracker know what a nail biter that one was. We rounded the buoy in fourth place, and went with a clever strategy of Matt’s that took us out to where we were the furthest east boat of the fleet. The course and wind shifts put us into the lead going into Narragansett Bay where the winds and tide turned against us as we struggled to sail to the finish, while our two closest competitors made up time and ground on us. The best part though was that we still finished ahead of them and everyone else on that leg. Also, this time around and concurrent to our race up the coast, we’ll also be conducting the second in our series of Bodacious Dream Expeditions! On our BDX website at bodaciousdreamexpeditions.com, you can track the race while at the same time augmenting the racing experience by discovering and learning more about the many wondrous natural and historical elements that make this particular course so legendary: the incredible Barrier Islands, the powerful force that is the Gulf Stream, the untamed weather of Cape Hatteras and the rapidly changing urban coastal environment around big cities like New York City. For this voyage, we’ll have a whole new set of engaging and subject-specific Explorer Guides (for you to share with the younger folks in your world,) which are full of fun facts and interesting questions and problems to work out. Here’s how to Get Involved! So, set your compass and your calendar for May 11th and the Atlantic Cup … and join the expeditionary force! Thank you, as always for your support!